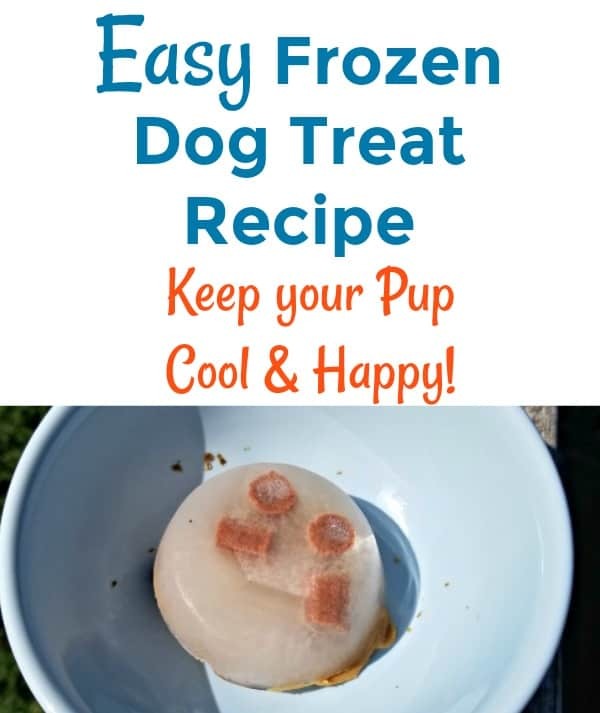 Easy Frozen Dog Treat Recipe: Keep your Pup Happy & Cool! You are here: Home / Lifestyle / Pets / Easy Frozen Dog Treat Recipe: Keep your Pup Happy & Cool! It has been incredibly hot here in the South this summer! 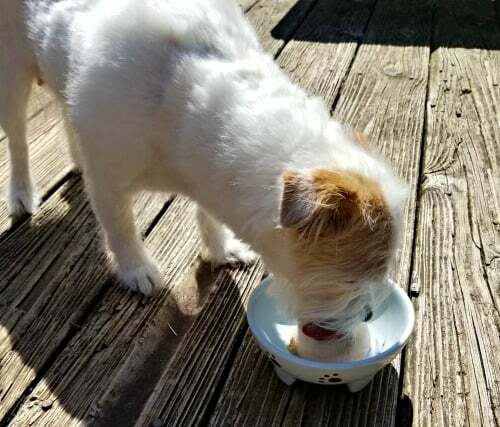 I have been looking for ways to keep my family cool, including my little dog, Obi. I came up with this super easy Frozen Dog Treat recipe that he absolutely loves and I think your pet will love, too! It’s no secret that I love spoiling Obi, he is my little cuddle buddy. I love giving him quality treats but it can get a bit pricey buying National Brands. I am lucky to live really close to a Food Lion store so it is convenient to just stop by on my way home to pick up any pet supplies that Obi may need. 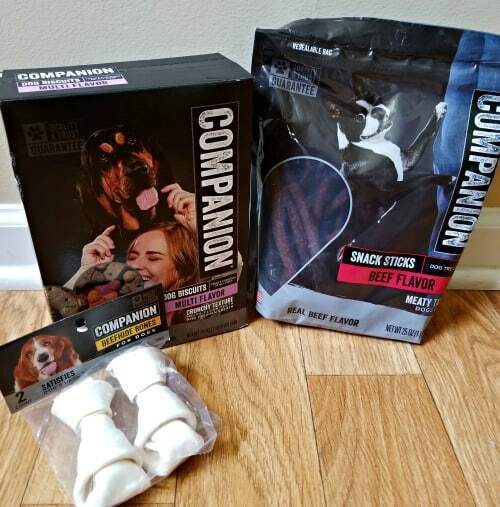 I have been getting him their new private brand pet products, Companion. The products provide complete and balanced nutrition with a taste Obi loves and a price that I love, Companion offers the best value in the category. You can find Companion products for your cat, dog, and bird. They have food, treats, toys, and accessories. You can go here to learn more. The Companion treats have really come in handy during this hot summer that we have been having. I love that they have little dog bones for him to chew on. These help keep him busy when he has to stay inside more often to stay cool. I had seen the National Brands that make frozen dog treats or doggy ice blocks and I thought that I could make a version that would be just as good and cost a lot less. I came up with this easy frozen dog treat recipe using ingredients that I already had in my home and they were a hit! Mix together the broth and water in a bowl and then pour evenly into a muffin tin. 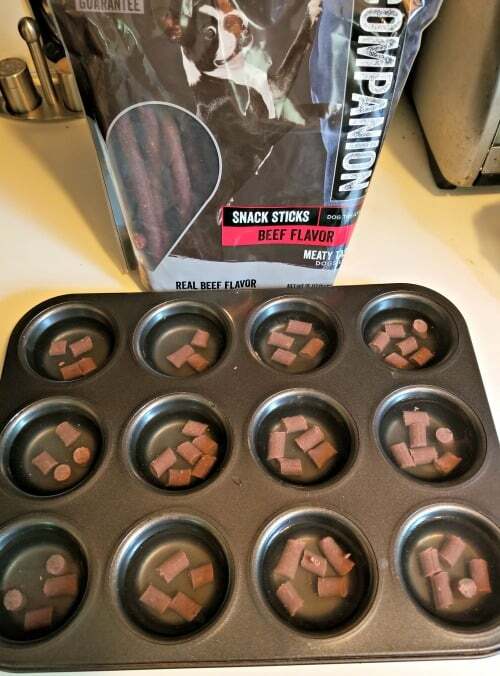 Add Companion Snack Sticks into each muffin tin. I put about 5 chopped pieces into each one. To easily remove frozen dog treats, run hot water over the bottom of the tin and they should fall out on their own. I put peanut butter on half of my frozen dog treats because I wasn’t sure how well Obi would like it, he is one of those weird dogs that will sometimes eat it and sometimes won’t. He loved the treats either way! 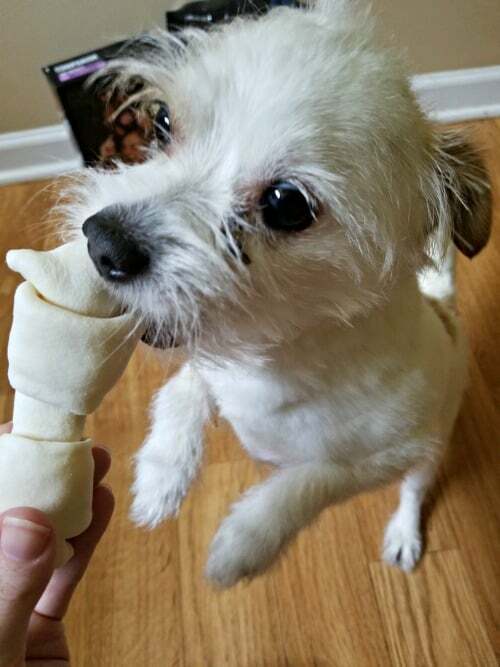 Obi is a very tiny dog, only 6 lbs, so these make the perfect size frozen dog treat for him. If you have a larger dog, you may just want to pour all of the liquid and treats into a large bowl and freeze it as a large doggy ice block. I stored the rest of the frozen dog treats in a freezer bag so I can just pull them out as I need them. This kept Obi busy and cool. He loved getting to the Companion Snack Sticks that were in the frozen dog treat! He loves the taste and I love the price of all of the Companion products. 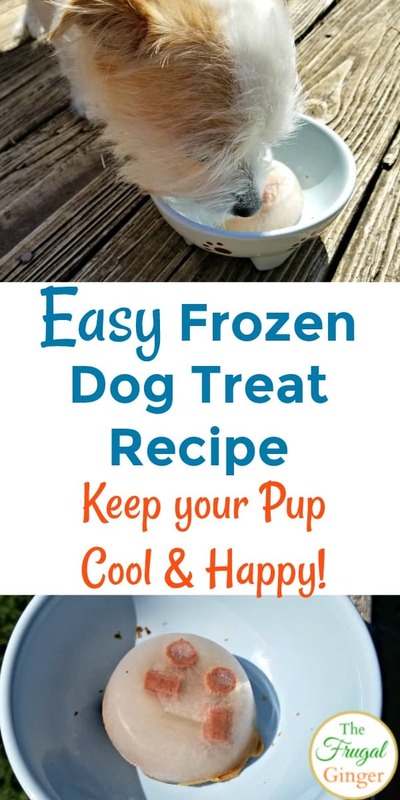 Give this frozen dog treat recipe a try and keep your dog cool and happy all summer long!